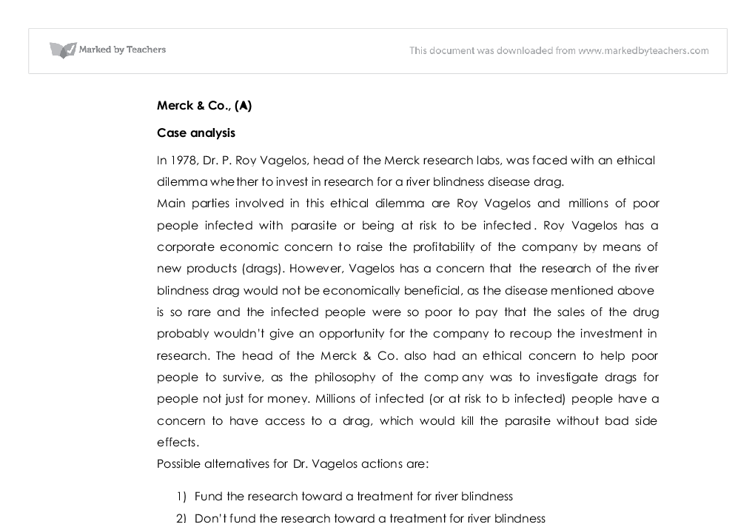 Merck & Co., (A) Case analysis In 1978, Dr. P. Roy Vagelos, head of the Merck research labs, was faced with an ethical dilemma whether to invest in research for a river blindness disease drag. Main parties involved in this ethical dilemma are Roy Vagelos and millions of poor people infected with parasite or being at risk to be infected. Roy Vagelos has a corporate economic concern to raise the profitability of the company by means of new products (drags). However, Vagelos has a concern that the research of the river blindness drag would not be economically beneficial, as the disease mentioned above is so rare and the infected people ...read more. Millions of infected (or at risk to b infected) people have a concern to have access to a drag, which would kill the parasite without bad side effects. 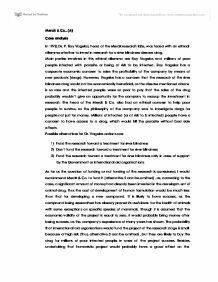 Possible alternatives for Dr. Vagelos actions are: 1) Fund the research toward a treatment for river blindness 2) Don't fund the research toward a treatment for river blindness 3) Fund the research toward a treatment for river blindness only in case of support by the Government or international aid organizations As far as the question of funding or not funding of the research is considered, I would recommend Merck & Co. ...read more. Though it is assumed that the economic validity of the project is equal to zero, it would probably bring money after being success, as the company's experience of many years has shown. The probability that international aid organizations would fund the project at the research stage is small because of high risk (thus, alternative 3 can be omitted), but they are likely to buy the drug for millions of poor infected people in case of the project success. Besides, undertaking that humanistic project would probably have a good effect on the reputation of the company. The image of "carrying" company would gain the trust of more people, who would probably turn to the products of Merck &Co. Thus, I recommend Dr. Vagelos to follow the firt alternative of action. ...read more. The experimental research design is best suited for the quantitative research method and the non-experimental research design is more suitable to the qualitative research method. 3.6 The Case study chosen According to (Jennifer Rowley, 2002) the case study is considered as one of the best method to gather the essential information related to the research work.